Cinderella SITE is a code-generator that generates ANSI C++ from SDL. It is closely integrated with Cinderella SDL. Cinderella SITE supports most of SDL-96 plus selected parts of SDL-2000 including exception handling. Code generation errors are reported in Cinderella SDL in the explorer view. SITE also allows generation code that produce MSC when executed. 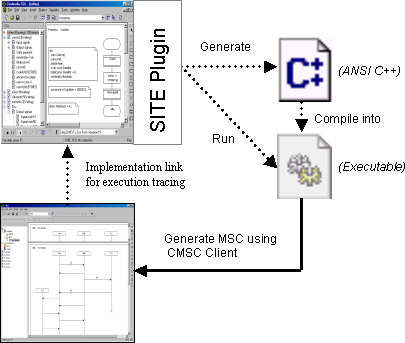 The MSC generation feature is decorated with implementation links back to the SDL model to facilitate execution tracing.